Bundesliga | Germany's 2018 FIFA World Cup squad: Where are they from? 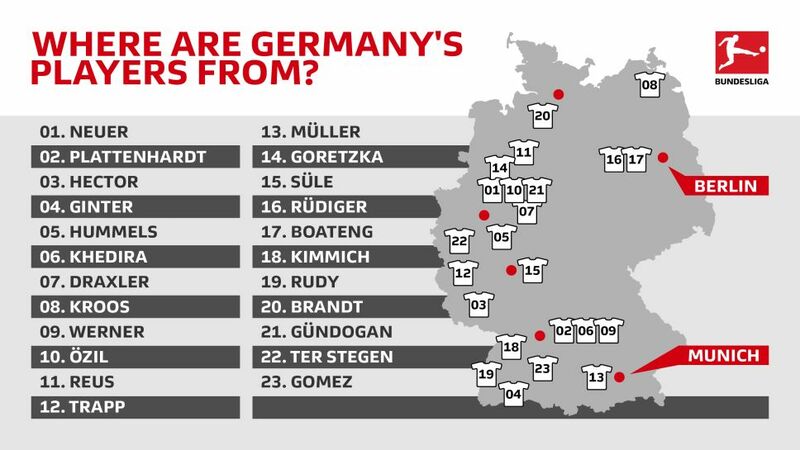 Germany's 2018 FIFA World Cup squad: Where are they from? From Bayern Munich to Schalke, Borussia Dortmund to Hertha Berlin, Germany's 2018 FIFA World Cup squad is a testament to the diversity and talent found across the length and breadth of Europe's most populous nation. Here, bundesliga.com details where each member of the world champions' squad took his first steps towards becoming a fully-fledged international. A Gelsenkirchen boy through and through, the current Germany captain is one of three members of the 2018 World Cup squad to hail from 'the city of a thousand fires'. After joining the Schalke academy at the age of five, Neuer spent two decades with the Royal Blues, coming through every youth level and going on to captain the club before his move to Munich in 2011. At Bayern he has gone on to confirm his status as the best goalkeeper in the world, winning the treble in 2013 and the World Cup with Germany in 2014. The left-back may have made his first team debut with newly promoted Nuremberg back in 2010, but he had a rather nomadic youth career around his native Stuttgart. One of the few players from the area not to be picked up by VfB Stuttgart, Plattenhardt started as a seven-year-old at local Frickenhausen, before joining FV Nürtingen at 13, SSV Reutlingen at 14 and finally Nuremberg at 16, having moved away from home. He would spend six years in Bavaria before being picked up by Hertha in 2014, going on to make a name for himself as a senior international in Berlin. The footballing story of Jonas Hector is a remarkable one. Germany's first-choice left-back currently plays for a team in Bundesliga 2, but that is just the tip of the iceberg. Hector is the only member of this Germany squad not to come through the academy of a Bundesliga club. He instead spent his youth career at local side SV Auersmacher. He made his first team debut in the fifth-tier Oberliga in 2009 just after turning down an offer from Bochum because he admitted he never thought he’d make it as a professional footballer. A year later though and he did say yes when Cologne came calling. Earning his stripes with the reserves, Hector made his first team debut two years later in 2012. Since then he has been a regular and is now held in the highest regard by Billy Goats fans, often taking the captain's armband. The only World Cup winner in Freiburg's history, Ginter spent a decade at the club from U13 level to the first team. He left his hometown team the summer he won the World Cup, making the big step to Borussia Dortmund. There he won the 2017 DFB Cup before deciding he wanted regular first team football and made the move down the road to Gladbach. His performances there, playing every minute of the 2017/18 season, ensured he would be called up once again by Joachim Löw for the World Cup. He may have made his name at Dortmund, but Hummels is in fact a Bayern youth product. Born in Bergisch Gladbach near Cologne, his family moved to Munich when he was young after his father accepted a coaching position at Bayern. Seven-year-old Mats also joined the club, going on to play for the reserves and later the first team. After just two senior appearances, he was allowed to join Borussia. During eight years there he won the World Cup, two Bundesliga crowns, the DFB Cup and reached the UEFA Champions League final. In 2016, though, it was time to return home and he re-joined Bayern on a five-year deal. The son of a German mother and a Tunisian father, Khedira was born and raised in Stuttgart, and joined local giants VfB at the age of eight. He would climb through the ranks and break into the first team at just 19. Shortly after his 23rd birthday and the 2010 World Cup, his 15-year association with Stuttgart came to an end. He joined Spanish side Real Madrid with a Bundesliga winner's medal in his bags, before a move to Italy and Juventus in 2015. Born in the western town of Gladbeck, Draxler moved to Gelsenkirchen at the age of seven before enrolling in Schalke’s famous Knappenschmiede academy at eight. The attacker would spend 14 years wearing Royal Blue, featuring in over 100 Bundesliga games for the club, making his Germany debut and winning the World Cup before transferring to Wolfsburg in 2015. But after only 18 months with the Wolves, a move to France materialised with Paris Saint-Germain in the winter of 2016/17. The youngest player and goalscorer in VfB history, Werner joined his hometown club as a six-year-old. At 17 he was handed his senior debut in a UEFA Europa League qualifier and awarded the prestigious golden Fritz Walter Medal at U17 level. In 2016 Werner surprised many by leaving relegated Stuttgart for Bundesliga debutants RB Leipzig, where he has become one of Germany's leading strikers and first-choice for the national team. Watch: From idolising Mario Gomez to taking his place for Stuttgart and Germany! Despite being born in Gelsenkirchen, Özil was a rather late arrival at the Schalke academy. His first youth club at seven was Westfalia 04 Gelsenkirchen, followed by Teutonia Schalke at 10, DJK Falke Gelsenkirchen at 11 and Rot-Weiss Essen at 12. He eventually joined the Royal Blues as a 17-year-old, scoring 10 goals as they won the U19 Bundesliga in his first season. In 2008 his contract expired and he joined Werder Bremen, where he won the DFB Cup and caught the eye of Germany boss Löw, who took him to the World Cup in South Africa. There he announced himself on the international stage, and after a number of offers chose to move to Real Madrid. Three years later he joined Arsenal in England, where he has been since 2013. During that period he won the World Cup in Brazil. A Dortmund boy who joined the Borussia academy as a six-year-old, he famously left after 10 years when the club told him they didn't think he was good enough. Undeterred, he went down the road to Rot Weiss Ahlen's youth academy and in 2008 scored the goal to get the team promoted to Bundesliga 2. A year in the second tier brought him to the attention of Gladbach, who signed the 20-year-old in 2009. Averaging a goal every three games during three seasons at the Borussia Park, he was brought back home to Dortmund in 2012. After moving around a number of youth clubs near his native Merzig in the west of Germany, the goalkeeper joined the academy at local giants Kaiserslautern as a 15-year-old. Within three years he was part of the first team but remained back-up until late in the 2010/11 season. He was first-choice for most of the following campaign, but left the club after they were relegated to join promoted Eintracht Frankfurt. For three years he was the undisputed No.1 until a move to PSG in 2015. In Paris he has alternated between a starting berth and the bench. Born in a town to the south of Munich, Müller joined Bayern at 11 from TSV Pähl. From 2000 to 2008 he made his way through the youth teams, into the reserves and finally the first team, where he made his debut as a substitute for Miroslav Klose on the opening weekend of 2008/09. The rest, as they say, is history. Seven Bundesliga titles, four DFB Cups, a Champions League and World Cup. Enough said. Watch: Thomas Müller: Bayern born and bred! Joining hometown side VfL Bochum as a six-year-old, Goretzka spent 11 years in the club's academy before breaking into the first team in 2012, scoring on his professional debut in Bundesliga 2. After just one season he was bought by Schalke. During five years in Gelsenkirchen he became a key part of the team, made his senior Germany debut, won silver at the 2016 Olympics and the FIFA Confederations Cup in 2017. Following his time in Russia at the World Cup, the 23-year-old will join Bayern. A giant on the pitch, Süle was born among the towering financial buildings of Frankfurt and joined Eintracht around his 11th birthday. However, he only spent three years there before a move to Darmstadt and quickly after that Hoffenheim in 2010. Things then moved at a pace for Süle as he made his reserves and first team debut in 2012/13. After three more seasons, where he made over 100 Bundesliga appearances and won his first senior Germany cap in 2016, Bayern came calling for the centre-back and signed him for the start of the 2017/18 campaign. Still only 25, Rüdiger can nevertheless lay claim to a rather nomadic career. The defender was in the youth teams of VfB Sperber Neukölln, Tasmania Berlin, Neuköllner Sportfreunde and Hertha Zehlendorf in his native Berlin before Dortmund picked up the 15-year-old. After only three years with Borussia he joined Stuttgart. Three seasons with the first team earned him his first Germany caps and a move to Roma in Italy, and in 2017 he signed for Chelsea. The second Berliner in the Germany squad, Boateng started off at Tennis Borussia Berlin before switching allegiance to Hertha as a 13-year-old. With the U17s he was German champion and twice reached the semi-finals with the U19s. His first team debut in 2007 was a 5-0 loss at Hannover, yet that didn't deter Hamburg from signing the 18-year-old. After three years there he earned a move to Manchester City, but his stay in England lasted just one season before Bayern brought him back to the Bundesliga, where Boateng has gone from strength to strength. Born in Baden-Württemberg’s oldest city, Kimmich was taken in at Stuttgart's famed academy as a 12-year-old. Despite being a product of the youth system, he never actually played for VfB at senior level. In 2013 he was signed by the rising Leipzig as they entered the third tier. The decision by Stuttgart to allow Kimmich to leave was described by later VfB coach Alexander Zorniger as "a huge mistake". After two years in Leipzig, Bayern boss Pep Guardiola decided he wanted to bring the talented all-rounder to Munich and personally oversaw the deal. From there, Kimmich's career has gone from strength to strength. Yet another Germany international to hail from the mineral-rich waters of southwest Germany, the young Rudy was also a keen tennis and ice hockey player but settled on football with Stuttgart in his early teens. After just four years in the academy, he joined the reserves and quickly moved up to the first team. Appearances at VfB were limited though, and in 2010 he made the switch to fledgling Hoffenheim. There he would spend seven seasons and make over 200 competitive appearances with performances that eventually caught the eye of Bayern, who brought the midfielder to Munich alongside Süle in 2017. Most of Brandt’s formative years were spent at hometown club SC Borgfeld, where he played from the age of five until 13. He then spent two years at FC Oberneuland before Wolfsburg picked him up in 2011. Despite playing for the Wolves at youth level he never reached the first team, though he did win the U19 Bundesliga in 2013. Instead he was signed by Leverkusen in 2014, where he has become one of the club's most exciting prospects. In the last two years he has become a full Germany international on the back of those performances, winning silver at the 2016 Olympics and the 2017 Confederations Cup. He now finds himself in Russia ahead of Manchester City's Leroy Sane. Born in Gelsenkirchen to Turkish parents, Gündogan did not end up coming through the nearby Schalke academy like Neuer and Özil, although he was briefly on the Royal Blues books as a boy. After spending most of his youth career with SV Gelsenkirchen-Hessler 06, the midfielder had a stint at SSV Buer and four years with Bochum before Nuremberg came calling in 2009. He got both his first Bundesliga assist and goal for Der Club in separate games against Bayern, before Dortmund brought him on board at the start of 2011/12. After a league and cup double under Jürgen Klopp, he became Guardiola's first signing at Manchester City in 2016. Born in 1985 in Riedlingen – a small Baden-Württemberg town around 80 kilometres south of Stuttgart – Gomez only joined VfB in 2001, after spending his formative years with local clubs SV Unlingen, FV Bad Saulgau and SSV Ulm 1846. The young striker quickly made a name for himself, helping Stuttgart win the Bundesliga title in 2006/07 and going on to be voted Germany's Footballer of the Year in 2007. Further success followed with Bayern between 2009 and 2013, and after spells with Fiorentina, Besiktas and Wolfsburg, the 32-year-old found his way back to VfB in January 2018, taking his old club to within a whisker of Europa League qualification and earning a spot in Löw's World Cup squad.